Searching for a simple way to bring eggs to the dinner table led me to this loose version of the Japanese rolled omelette. I was looking for something a step up from scrambled— although warm, creamy, and topped with herbs, they are sublime—and not quite as heavy as a frittata, or as ethereal as a souffle. And simple— everything goes in the oven and then into a bowl. The eggs here come out very tender. Arrange the shelves in the oven so one is just below the center and one above with enough room on the center shelf for the baking dish with the eggs. Get the oven going at 375º. 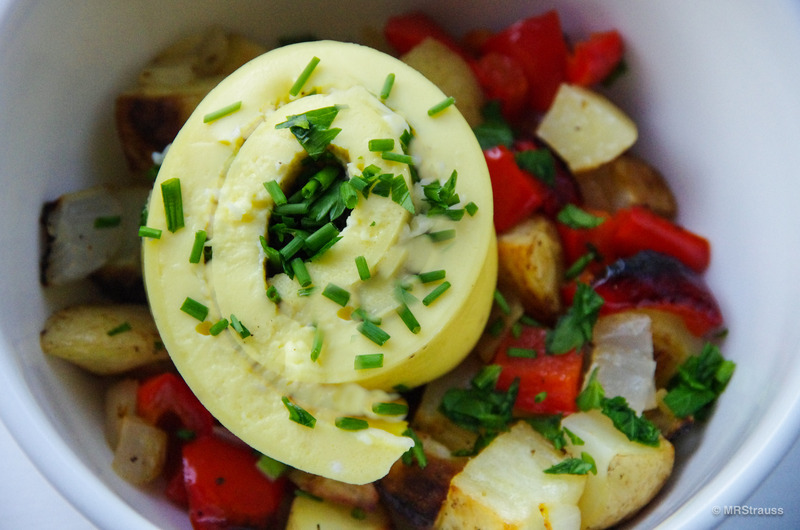 Put as many potato cubes—I use Yukon Gold—yellow onions and red pepper as you want in a bowl. I have been cutting everything into cubes somewhere around a half inch, but larger or smaller would work fine just the timing would be a little different. You can also add other root vegetables, like carrots or parsnips, different onions, any color of peppers— I think I will try orange peppers next time. Toss the vegetables in some good-tasting olive oil—or oil of your choice— and spread out on your baking sheet. Sprinkle with a little sea salt and fresh cracked pepper. Put in the oven on the top rack so it can get started. The potatoes will take around 45 minutes including browning. Set the bowls on the stove to warm. There’s a bit of time here; I usually get the stuff for the eggs out and catch up on some reading. Grease some sort of pan or oven-proof dish that is around 10×15 with butter and line with parchment paper. I use a Pyrex baking dish and I usually cut one piece of parchment about ten inches by twenty-three or four inches so it hangs down the sides. This will help you roll the omelette. In a large bowl, whisk together one cup of whole milk— soy or almond milk may work here but I’m allergic to them so I can’t say— with a quarter cup of flour by adding the milk slowly to the flour until it is blended. I used basic all-purpose flour but I’m sure other flours, such as rice flour, would work as well. Add six large eggs, a tablespoon of Dijon mustard, and around half a teaspoon each of salt and pepper. Whisk everything together. Pour the egg mixture into the parchment lined baking dish. When the potatoes have been in around 30 to 35 minutes, place the eggs on the middle rack. This will go for ten to thirteen minutes or so depending on how runny or firm you want your eggs to be. While the eggs are cooking, finely chop a bunch or handful of chives and then a similar amount of parsley. Shred the cheddar cheese if using. This entry was posted in Bentosh and tagged Chives, Eggs, Potatoes, Tamagoyaki on May 27, 2015 by mrstrauss.